The Postings in Kirkcaldy is home to shops including a Farmfoods and a Lloyds pharmacy. 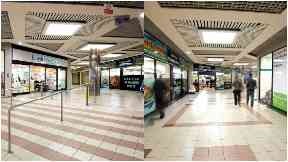 A shopping centre in Kirkcaldy that went to auction with the starting price of £1, has sold for £310,000. The Postings in Kirkcaldy was sold to a mystery telephone bidder, who faced fierce competition from a bidder in the room. The auction, which included 143 other lots, took place at The Berkley - a luxury hotel in London's Knightsbridge. The shopping centre has a capacity of 21 stores, but currently only seven units are occupied. Farmfoods and Lloyds Pharmacy are among the retailers who have units in the centre, which also comes with a car park for 299 vehicles. The Postings attracts more than 30,000 visitors each week. However, it has seen revenues decline with the rise of online shopping and the loss of a Tesco store once based in the centre. A spokeswoman for the previous owner, Columbia Threadneedle, said: "We acquired The Postings more than 15 years ago as an income proposition. "It has since been re-positioned as a development opportunity, which does not fit the holding fund's investment strategy. "We are pleased that The Postings has moved on to a new owner who can hopefully reposition and revitalise it to the benefit of the local community". London-based auctioneers Allsop put The Postings under the hammer on Tuesday morning and the auction was live streamed via their website.